The original Dellorto VHB carburetors are well-made, sturdy, and durable. Nevertheless, damage can be inflicted. Often, the most difficult damage to deal with is stripped threads. 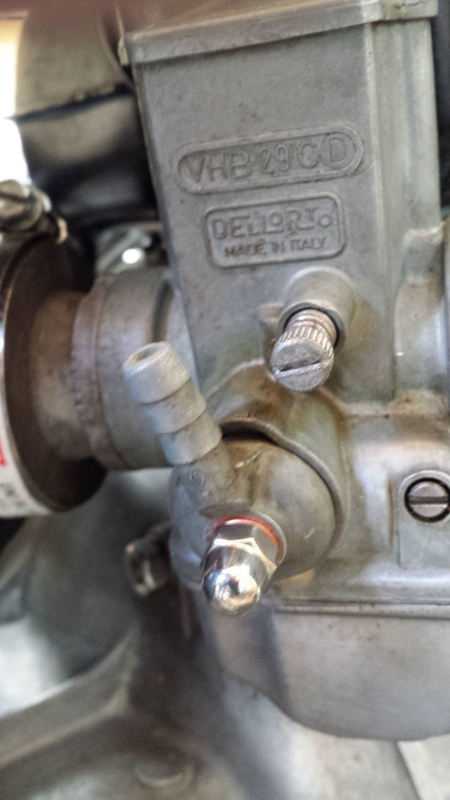 Here are some ideas that may help you get your Dellorto VHB carburetor back in service. Thanks to Charlie Mullendore of Antietam Classic Cycle for providing me with some of this information. The threads in the top of the carburetor are 4 mm × 0.75 mm. The thread pitch of 0.75 mm is very uncommon (0.7 mm is very common). The metal used to to construct the carburetor is somewhat soft. You may be able to ***GENTLY*** squeeze the threads together using a bench vise. This may tighten everything up just enough. Purchase a longer bolt that will (hopefully) catch good threads deeper down. 4 mm × 0.75 mm taps and dies are relatively common, so you may be able to cut some new threads deeper down. The American Sportworks website lists some fasteners in the correct 4 mm × 0.75 mm size. See 14418 Screw, M4 X .75 X 10 PHMS DAC, 14420 Screw, M4 X .75 X 31 PHMS ZN, and 14493 Nut, M4 X .75 Hex DAC. You can also tap the threads to 4 mm × 0.7 mm and then fit a longer, readily available fastener to secure the top. JB Weld a 6 mm stud in the hole and secure the banjo with an acorn nut. If you could machine a stud that was 1⁄4 inch × 20 on one end and 6 mm × 1 mm on the other, then tap the body to 1⁄4 inch × 20, the extra diameter of the 1⁄4 inch end (approximately 6.35 mm) might grab hold without the need of JB Weld. Or tap the carb body 1⁄4 inch × 20, enlarge the hole in the banjo and use a 1⁄4 inch × 20 bolt to secure it. 6 mm stud with an acorn nut. Photo courtesy of John Mee. You may bore the thread through the metal completely. Use a threaded pin and a cap nut instead of the bolt. Secure the threaded pin with Loktite blue and don't loose it anymore. Alu-solder may work, but I think that would be the very last option.